One Compartment restaurant sink. NSF approved for food service use. 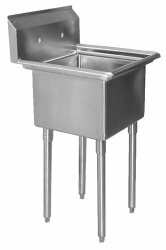 Commonly used as a produce sink required in most areas. Stainless steel bowl with galvanized legs. 18 gauge 304 stainless steel. Meets standard health department requirements. Made in the U.S.A. We recommend the Krowne 8 inch faucet featured below. Spec sheet also shown below for health department approval.